These terms and conditions apply to all www.muchaswimwear.com users, its subdomains, and social media. The T&C will be validated and activated for all future transactions with Muchá. Muchá reserves the right to review these terms and conditions whenever it’s necessary. The users are responsible in bringing themselves up to date if changes are made. 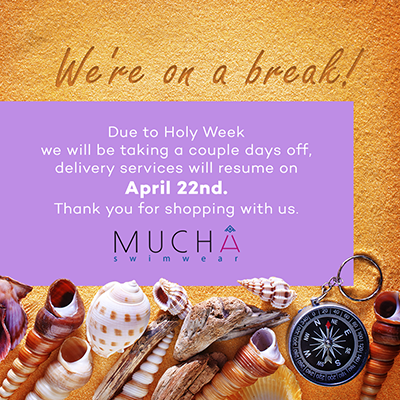 Muchá doesn’t guarantee that every single article included on this webpage are in stock on the purchase time. In the event when this occurs, Muchá will contact you in any way possible. Muchá also doesn’t guarantee that this website may have typographic or inaccuracy errors, nor that the information is up to date when you visit the website. Even though Muchá displays the right way of texts, images and prices, errors may occur. If you have been charged with an incorrect price, Muchá will take your case seriously and charge you with the correct price, modify or cancel your order and give you your money back. Muchá also reserves the right to cancel any order prior to be delivered when the price is incorrect. In these cases, we will contact you before this occurs. If we don’t get answer from you about that time, your order will be canceled immediately. The delivery services are not handled by Muchá, so our brand only acts as a third person and will not be responsible for any error resulting on these activities. Muchá will not be responsible for any damage occured during the delivery process. Muchá also is not responsible for any damage occured for the use of this website, nor guarantee you an uninterrupted use. The copyrights of documents provided by Muchá in this website, including Muchá brand, logos, graphics, texts, pictures, photos, designs, icons, data, and software, are property and licensed EXCLUSIVELY of Muchá. You are authorized to use the previous things mentioned above only and exclusively for personal purposes, never for commercial purposes. You can download, print and save this website visual materials for personal purposes only. You are not allowed to charge no one for the usage of this material nor publish, duplicate, or distribute without a previous consent of this brand. You cannot modify the material in any way. Every personal information stored in this website will be managed with best delicate care possible. This stored information will not be selled or used for other purposes rather than to assure you the best service possible. Your information will only be used by us to inform you of any marketing opportunities or discounts. Your personal information will only be revealed to third people only and exclusively to fulfill the purposes above cited. the information is incomplete or wrong, you have the right to modify it to get it the correct way. All customers paying with credit or debit card are subject to validation verifications to assure your information. For security reasons, we don’t save any payment information on our database. This website might contain links to other sites out of our reach. We are not responsible for content and privacy policies of others. Muchá has the right to seek all probable solutions available in law and equity for any violation of these Terms and Conditions, including the right to block the access to this site. People intending to violate any protected area or data will be punished with the force of law. In these cases, Muchá’s obligations will be suspended. The contract between you and Muchá can be terminated partial or totally by you or by Muchá. A major force can constitute in events like wars, civil war, attacks, blockings, government extreme measures, failure on communicational services, natural disasters, or any similar event out of Muchás reach. Under these circumstances, Muchá reserves the right to attend and resolve inconvenients in cautious time. These terms are included in Guatemala’s justice law and courts. These courts will have the exclusive jurisdiction over any dispute under this agreement. Foreign countries’ laws may vary with Guatemalans’ and they may have additional law requirements. You must apply regulations and law locally and internationally for this website usage. Muchá website uses the Thawte SSL Certificates, which secures communications by encrypting all data to and from the site. When placing an order, you can immediately check the security validity by clicking the Thawte icon at checkout. For security reasons, we do not store any payment information in our database.